If your file type isn&apos;t one of the above (e.g. if it&apos; PowerPoint or LaTeX) then open the application you used to create that file and use its File Menu to do a “Save As” or “Export” or “Print to PDF” to convert your document to one of the five formats we accept (or perhaps use a 3rd party converter application). Copy-and-pasting from another format will almost never give good results, e.g. your document may wind up with white space (carriage returns) after every physical line rather than just between paragraphs. Once selected, you can use the file name as your document title or, more commonly, give the document a more explanatory name (if you change your mind about which file to upload you can choose another file by clicking the small gray “Choose File” button next to the name of the currently selected document). 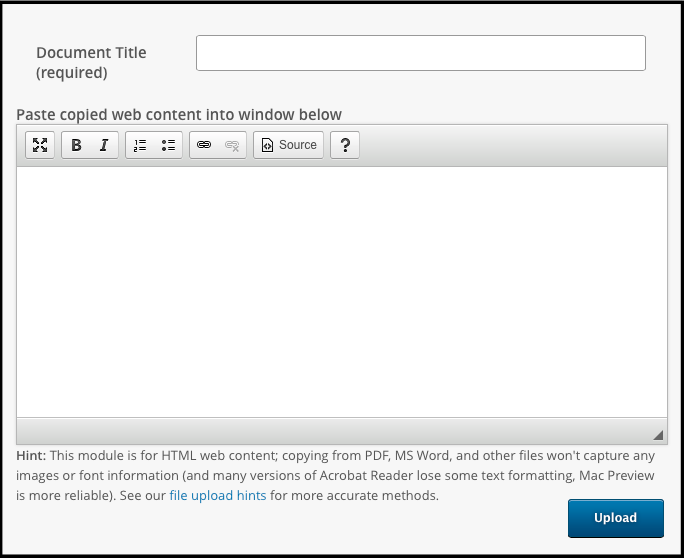 Now click the blue “Upload” button (toward the bottom right corner of your screen) to upload your document. If your document doesn&apos;t come out well-formatted, see other PDF options. Image overlay issues are discussed below. You can upload a document containing only a photo or other image and comment on it with our image toolbar. At any point afterwards you can also append text and/or video and/or another image to the image you&apos;ve uploaded. NowComment handles JPEG, Png, Gif, Tiff, and SVG formats. We strongly suggest avoiding Tiff because most browsers can&apos;t display that format. Tooltip — this is text that will pop up when someone who can see the image mouses over it. It can be the same as the Alt text. You can now click the blue “Upload” button (toward the bottom right corner of your screen) to upload your image. 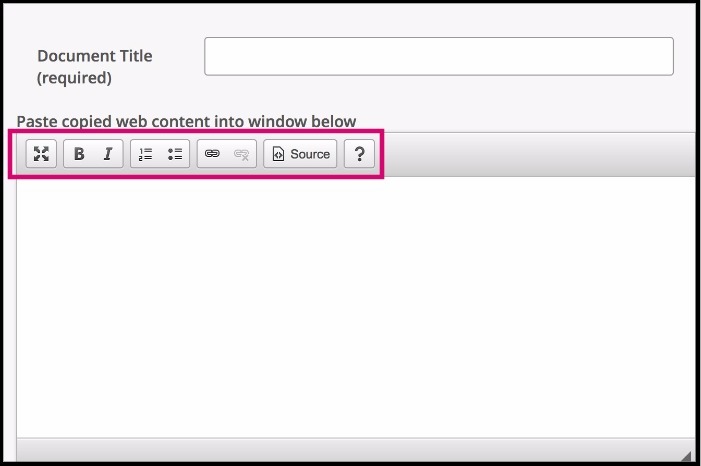 Copy all the text and images you want in your document from the desired web page(s), then paste what you copied into the big data entry box (under Document Title). 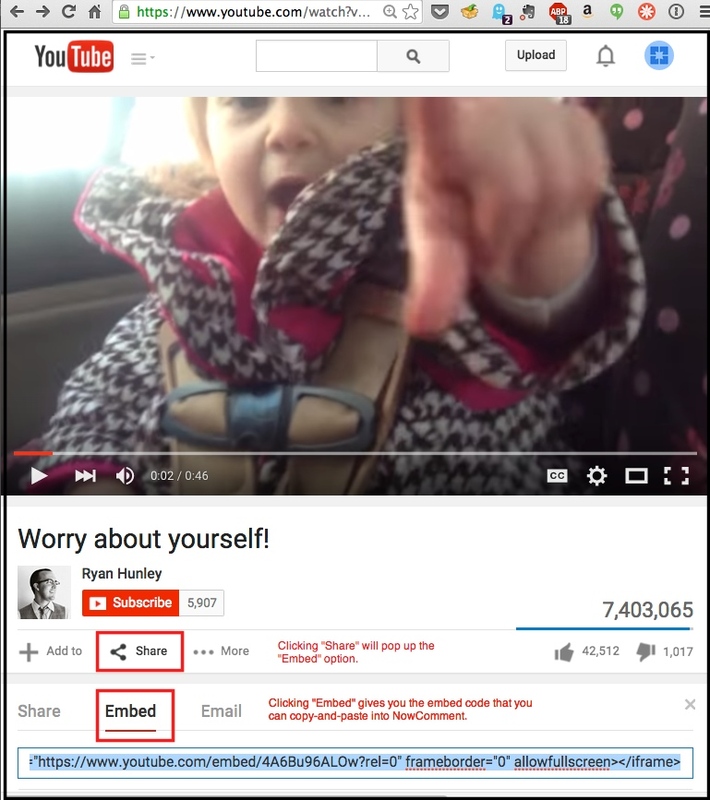 You can delete any content not needed for discussion (e.g. irrelevant text and graphics, advertisements, site navigation links, whatever!) from the data entry window to give your readers a clean, customized document. If there is video or audio content from that page (or from other pages or sites!) that you also want in your document, copy and paste the embed codes from each media player (see next section); copying the media player itself, unlike copying text and images, will not work. For video and audio players, paste their embed codes (sometimes referred to as “Share” or “Sharing” information) into the NowComment data entry box wherever you want that media player to appear in your document; you have control over the page arrangement! We recommend that you use the Edit Menu of your operating system to do the pasting of the embed code (what some of them call call “Paste and Match Style”) instead of just doing a regular “Paste” via Control-V or Command-V; this ensures that you&apos;re not inserting any extraneous HTML formatting from the embed code that might interfere with our software. Again, note that copy-and-pasting the media player itself won&apos;t work! PDF, Excel, PowerPoint, MS Word, and other documents in proprietary formats, even if online, are not really HTML, and copy-and-pasting their content into an HTML data entry window won&apos;t give good results. For file conversion tips see our upload hints page. You can write something on the spot with this option, e.g. a quick note or an idea you&apos;d like some quick feedback on. You can add HTML web content to it if you wish. This module looks and works just like the Web Content (HTML copy-and-paste) module above. Text and images will appear in the Preview window; video/audio media players will not, but as long as the video/audio embed code is showing in Preview the player will appear online when the document upload is finished. You then chose which formatting you prefer; you probably don&apos;t want to join lines in poems and some other special case documents (but in these cases you should use line breaks instead of carriage returns, see our tips on avoiding unwanted white space). 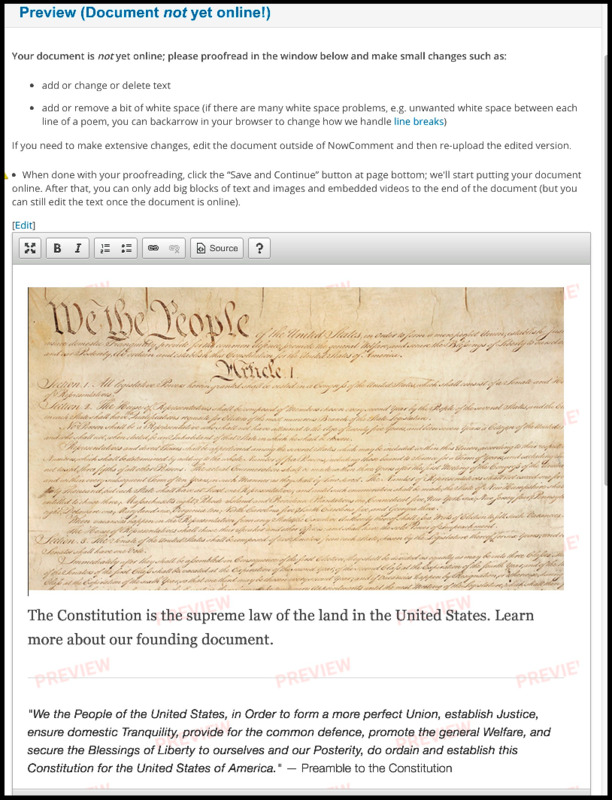 If extensive changes are needed, or if the document&apos;s formatting is a problem, it&apos;s best to make the edits outside of NowComment and then re-upload the document. But if you&apos;re satisfied with your document, click “Continue”. NOTE: NowComment can display the vast majority of images without problem. Some PDFs and Microsoft documents, however, contain “overlay” images that look like a normal image but have both a text layer (e.g. the names of states) displayed on top of an image layer (e.g. a map of a country). HTML, the basic building block of the Web and NowComment, can&apos;t display such 2-layer images properly (among other problems, they use “absolute positioning” which doesn&apos;t work with browser windows of various sizes. If NowComment detects overlays we&apos;ll flag the problem before you reach the Preview page and will present some workaround options. For more information see our overlay documentation. An “i” information icon appears next to each choice explaining it more fully. If an advanced feature is set via the &apos;s “Edit Properties Page” NowComment will take you to that page directly. When done reviewing these optional features, click “Continue” and your document will begin uploading. Your document is now online; click the “view it now” text link to go your document and start commenting on it, and/or share it with others. 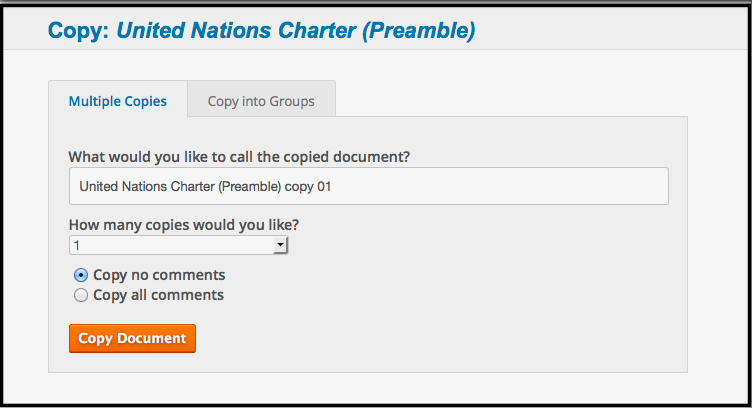 This isn&apos;t necessarily part of uploading a document, but it lets you upload a document just once even if you want multiple groups/classes to comment on it separately from each other. If you aren&apos;t using Groups, specify how many copies you want, what suffix should be appended to each document so you can distinguish the various copies form one another (default is copy 1, copy 2), and whether existing comments on the original should or shouldn&apos;t be carried over to each copy (teachers might want to “prime the pump ” by inserting some notes or questions as comments). The image below looks like the one above, but the 2nd (rightmost) tab is shown here. 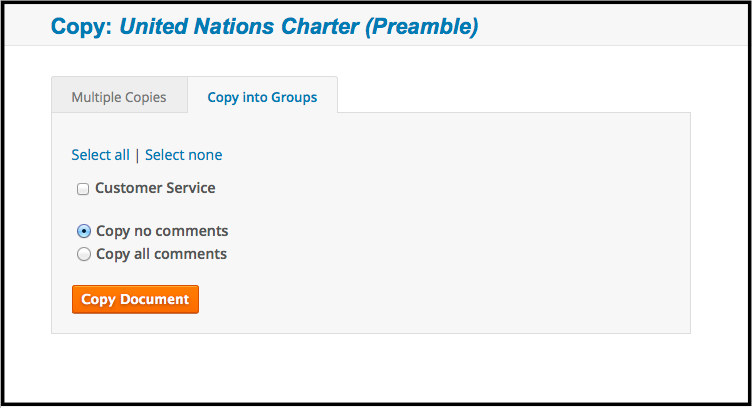 This feature pulls up a checkbox list of all the Groups you&apos;re an Admin for (in the screenshot example above there&apos;s just the Customer Service group) and lets you share a copy the document with each Group you click on (or click the “Select all” link for all) and automatically invite each selected Group to the document… all in a single step! The Group name is automatically used as a suffix at the end of the document name so you can distinguish the copies from one another. That&apos;s all you need to know about uploading documents. It&apos;s very easy and only takes about a minute; try uploading a test document now! We have other videos and tip files to help you get the most out of NowComment … and do take a look at our “Features Gallery” overview. This software uses ABBYY® FineReader® Engine 11 2013 recognition technologies © 2013, ABBYY Production LLC. ABBYY and FINEREADER are trademarks of ABBYY Software Ltd., which may be registered in some jurisdictions. © 2001 ParaType Inc. © 2003 ParaType Inc. Opening DjVu images: © Portions of this computer program are copyright 1996-2007 LizardTech, Inc. DjVu is protected by US patent No. 6,058,214. Foreign patents pending. U.S. Patent Nos. 5,490,216, 5,625,465, 5,768,416 and 6,094,505. Abbyy licenses JasPer Version 2.0.